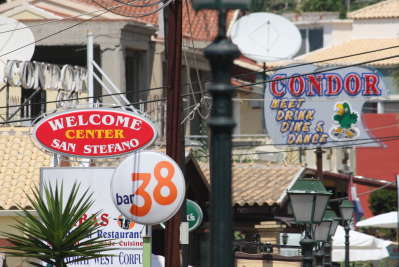 Agios Stefanos is more commonly known as San Stefanos by all bar the locals and even some of them have adopted the name but should they? You might ask why is that important? I will leave that to Spiros across at The Hotel Nafsika Blog to argue and for you to decide. We all understand and accept that companies are generally in business to make money. However, when large companies misuse there position to manipulate the situation it is not acceptable. The large tour operators are doing just that, I will not name names because I do not have enough direct evidence to defend what I have to say in a court but I do believe what I have been told and what I have personally experienced. We, about forty of us, recently tried to book a holiday with one of the biggest tour operators to a location on Corfu run by small local family business. First, despite being very successful for quite a number of years they have for the second year running been omitted from the brochure. No problem we thought, like last year - we'll book online, no they do not appear there. OK we know the people well enough to have a direct telephone number, we'll ring them up and check. They tell us everything is OK just a small glitch with the details of the contract which will be resolved in a few days. A week later we get a telephone call they have been dropped by the tour operator and will now take bookings directly despite no desire or experience! So about half of our group of sixteen families decide to book directly and start to book flights. Three days later, another telephone call and disaster the tour operator has now changed there mind and are now accepting bookings. However, they will not honour any bookings made directly so please don't book your flights. Most families had not booked there flights so just forget the bookings and book with the tour operator, easy you would think! No! We know the accommodation is empty because the tour operator has only just added it to the web site. However, the tour operator is only releasing one or two rooms at random intervals after the previous release is booked and will tell you on the telephone there is nothing available; so over a couple of weeks we spend our holiday trying to book our next holidays with the tour operator. Thank goodness we were not paying for the internet access due to the local people feeling guilty about our problems. Eventually everybody gets booked some had to book a room one day and another on the day following, how stupid can they get? One family because of the chaos ends up booked into a three bedded studio which with mum, dad and twenty year old daughter is not acceptable. However, some more horse trading and with the cooperation of the locals everything is settled. In truth we only managed to sort the mess out because we are quite a determined bunch and because the locals were very helpful, which is more than you can say of the tour operators. I just hope they never work out what we have done. No doubt there will be more trouble next year because like lots of people who go to San Stefanos we will want to book again. Generally the bars are open for the greatest part of the day and into the night, however don't be surprised if you find a closed bar during the day, most of the trade is done in the evening and some bars specialise in being open late. Somewhere between eleven thirty in the evening and one in the morning the number of bars open decreases to just one or two but you will still probably find somewhere to have a drink. However beware the restaurants will have closed by eleven so you are best to have a seat by ten. We have been forced to have a takeaway because we had failed to notice the time when we were in a bar. 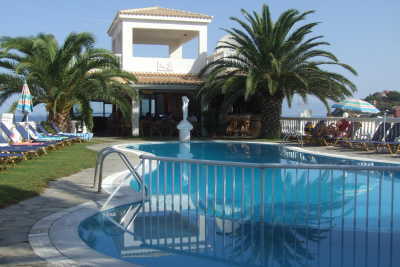 The Tsaros Pool and Bar is on the hill and commands one of the best views in San Sefanos. Tanasis now runs the bar with help from the rest of the family including his dad Nicos. During the daytime this is a great place to come for fun but beware it is not necessarily a place to chill. This is because the pool is often filled with fun loving youngsters, splashing and swimming. However, you will never be boarded as something is always going on. In the very late afternoon and the very early morning the atmosphere is different. A quiet chilled calm settles over the pool with the water quiet or even occasionally still. These are the times for a quiet read or swim. In the late evening the pool is empty and the bar full of people having a quiet drink but Tanasis choice of music ensures that the fun returns as the drinks flow. Every now and then it really erupts and a raucous time will follow, cards, pool, music and beer stop it getting to be too much. As many people are sleeping locally the music becomes much quieter as the night settles in but the bar will not close until you are done. The exception to the nightly bar activity is the weekly barbeque where for a fixed price everybody get feed from the grill. Lamb chops, burgers and sausages (English) are accompanied by salad and bread. All without having to walk down and then up the hill, a wonderful evening. Time moves on and this year the last bar open was El Greko and it has become the place to be for the younger amongst us. The atmosphere varies with the time of day from the frantic to the very relaxed and the booze just seems to flow. Table service is the name of the day and you will not pay untill you leave which can be a surprise if you go too wild - something to remember in most of the bars. However, don't worry you won't get ripped off! 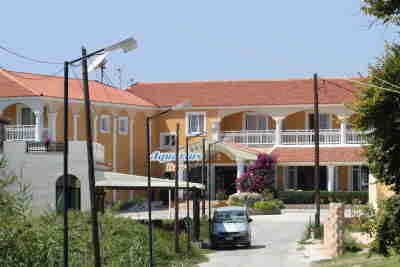 Half way along the main road we have the entrance to the Athina Hotel. 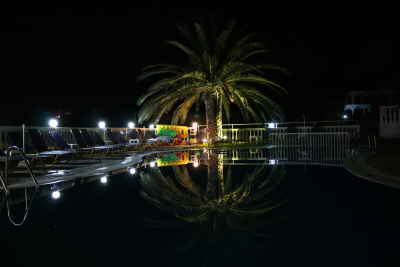 The hotel is a Thompson Holidays exclusive very much in the tradition of such places. As a result we have never been in but the pool is the largest in town and great, fresh water no chlorine and no green stains on your white swimwear or blonde hair. Last season they started charging for the sun beds but you get your money back when you buy something from the bar so it's not too bad. On the left just before the hotel is the Aquarius Bar. Here the young English proprietor will do everything he can to help you have a good evening. Off the main strip the road is even quieter and the atmosphere is very relaxed, just sit outside and watch the world go by, brilliant. So if you want a drink where the bar man is English I can highly recommend this bar. Spiros Bikes is in the foreground on the right here you can hire your wheels. The chaos that is a Greek street as seen from a distance is clearly illustrated here but with a point. The signs for Bar 38 and the Condor point the way to two of the most popular bars in town. Bar 38, which is the choice of our children, has reopen over the road and has a very friendly atmosphere, noisy, bright and full of fun. The children, young adults, love the new decor much more up to date. Last year daughter had her camera taken behind the bar and her photographs became the background to our evening. How you might ask; well they were projected on the screen at twice life size. I'll tell you a picture of your half awake teenager can be very very funny. The spectacle is even funnier when she stands there spluttering a protest and not really getting anywhere - a fun night. All the pools, restaurants and hotels also have bars, they all serve a range of drinks including soft drinks and chilled water. So don't be scared to ask, just enjoy the hospitality and relax. All material on this site is copyright of &COPY; T&F Smith 2007-19 and cannot be reproduced without consent.